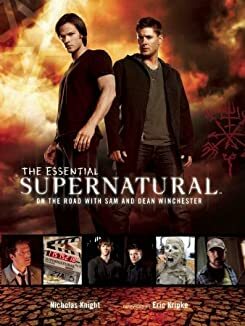 Publisher Insight Editions will be unveiling The Essential Supernatural: On the Road with Sam and Dean Winchester, an ultimate visual guide for the series timed to arrive for the Supernatural season eight premiere, Oct. 3, 9 p.m. on The CW. According to the press release, The Essential Supernatural will be a 192-page companion to the series written by Nicholas Knight, with a foreward by series creator Eric Kripke. It will retail for $50. Haunted by the death of their parents in a mysterious supernatural conspiracy, brothers Sam and Dean Winchester (played by Jared Padalecki and Jensen Ackles) hunt down demons, monsters, and otherworldly creatures lurking in darkness. This stunningly comprehensive coffee-table book dissects all seven seasons of the thrilling show and looks ahead to season eight - with deep insights from extensive cast and crew interviews, beginning with a revealing foreword written by the show's creator, Eric Kripke. The book is visually breathtaking, with candid behind-the-scenes photos, revelatory production art, and collectible pullout elements, such as postcards, stickers, photos, and a map that details the cross-country adventures of Sam and Dean. "From demons to angels (and even the Apocalypse), Sam and Dean Winchester have faced it all," relates Sonia Borris, Senior Vice President, Marketing & Operations, Warner Bros. Worldwide Television Marketing. "After seven seasons, the world of Supernatural is so rich in its mythology, creatures and characterization that a companion guide like this is indispensable. Going into season eight, this is a must-have for fans old and new alike." Returning for its eighth season this fall on The CW, Supernatural stars Jared Padalecki and Jensen Ackles as Sam and Dean Winchester. Created by Eric Kripke and executive produced by Robert Singer, Jeremy Carver, Phil Sgriccia, McG and Adam Glass, the series is produced by Wonderland Sound and Vision in association with Warner Bros. Television and distributed worldwide by Warner Bros. International Television Distribution. "With unparalleled scope, The Essential Supernatural offers fans amazing insights, keepsakes, and insider-knowledge from the world of their favorite show," said Maryellen Zarakas, Senior Vice President, Worldwide Marketing and TV & Studio Licensing, Warner Bros. Consumer Products. "This thoughtfully curated companion book will engage Supernatural's many fans and build excitement for the upcoming eighth season." Get ready to drive full-speed into the hidden world of Sam and Dean Winchester, hunters of demons, ghouls, vampires, and all things ... supernatural!